I admit it, I have a serious farmer’s market addiction. I love the markets not just because I can get the freshest, most in-season fruits, vegetables, and nuts, but like many people, I appreciate the fact that I can get products that you simply can’t get in stores – even some of the best natural foods stores. And of course, the community is unbeatable, both customers and farmers. The relationships we all build at the market are an essential part of our growing community. And one of these relationships is under immediate threat – the Lindners need your help! Over the past decade or so, two of the farmers I’ve particularly enjoyed speaking with are Ken and Kathy Lindner, proprietors of Lindner Bison. It would be hard to find two people more dedicated to their animals, the restoration of the pasture on which these ancient, hulking animals graze, and the quality of the food they bring to market. To hear them talk about the importance of restoring bison to parts of our country where formerly they roamed in vast herds is inspiring. The bison itself is delicious, grass-fed, grass-finished, humanely harvested, and pretty much everything that someone would want when shopping for real, nourishing meat. So imagine my surprise when I received an email from Kathy Lindner last week saying that they had been banned from selling at Los Angeles-based farmer’s markets until they could find cold storage in a “county approved facility.” However, “county approved” is not defined; the county’s approach has been of the “pay a fee, send us your plans and we’ll let you know” variety. The Lindners have tried to fulfill the requirements, even hiring someone back in April to draw up and submit plans to the county. $800 in licensing fees and countless rejected plans later, the person they hired gave up in frustration, leaving them exactly where they started – without the space the county demands, and without a clear path forward to establishing it. Couldn’t they just rent some cold storage space, you ask? In a word, no. Cold storage facilities in Los Angeles are geared towards mega-stores like Ralph’s and WalMart, not a couple of farmers who need to plug in four chest freezers. The cost would be prohibitive for any small business, and making it worse, access to such space is limited to weekdays; of course, most of farmer’s markets in which the Lindners participate are on weekends. The county has told them that it would be fine for them to keep the meat stored on their farm and bring it directly to market. But their land is 600 miles – 12 hours each way – north of Los Angeles. In vain, they’ve looked for commercial kitchen space, catering kitchens, and the like, for someone willing just to rent them the space to plug in their freezers. What’s at issue here is something that affects most small family farms in one way or another: the lack of regulations that take into account the gaping gulf between small family farms (run by one or two people with a few farmhands, with small acreage, who sell direct to consumer and possibly a few restaurants or small stores) and agribusiness farms (which may or may not be owned by a family, but which employ many people, have large acreage, and who sell primarily to wholesalers). But unless there are specific exemptions in place in health regulations, agricultural regulations, and the like, the small farm must meet exactly the same requirements as the ginormous one – for no additional benefit to the public, but at the risk of driving the small farmer under. Information about the Lindner’s plight tore around the community last week, and Friday they received a call from the Director of Environmental Health, Anjelo Bellomo, seeking a meeting today (Monday), and the ban was briefly stayed till August 1. Clearly, the calls and emails from a few dozen people made a difference. However, August will come quickly, and unless the County is willing to work with the Lindners to either allow them to store their meat out of county, where they may be able to find affordable storage, or help them find a commercial kitchen (after all, Environmental Health inspects virtually every restaurant and catering kitchen in the county, so you’d think they might have a lead or two! ), this wonderful couple will be out of business. No matter what part of the country you live in, this is worthy of your attention. The Lindners are one of thousands of small farmers working to make a difference, to keep high-quality, ethically raised food available to their community. They do the right thing in every respect, and like all ethical, sustainable small farmers, they deserve your support! Please keep the pressure on! Make four phone calls, and/or send four e-mails, to keep the pressure on and to let the county of Los Angeles know that people do care about farmers. Lindner Bison has followed the spirit of the public safety law by using commercial chest freezers for their products. They cannot afford commercial space which is inaccessible on weekends. A one-size-fits all regulation grossly penalizes small farmers and businesses. This regulation was written for huge food distribution corporations like Ralph’s or Safeway, not two small farmers who have consistently brought safe, healthful meat to L.A. for a decade. Please lift the ban on Lindner Bison immediately and stop all legal action against them. They deserve far better than this for their spotless reputation in bringing superior quality meat from humanely raised animals to Los Angeles families, as well as their heartfelt and caring efforts to restore a heritage animal to the state. Thank you. You can stay up to date via the Lindner Bison Facebook page. This entry was posted in Agriculture, Food politics, Nutrition, Small farms and tagged farmer's markets, food police, Lindner Bison, Los Angeles by Blochster. Bookmark the permalink. Hi, Kim, You are so kind to make the suggestion! The issue here is not getting the meat to and from the markets as much as it is where to store it between markets. Their farm is 600 miles away from the markets they serve (12 hours one way), making day-in-day-out farm storage prior to transportation impractical. No, they need a space approved by the city to plug in four not overly large freezers. Keep your fingers crossed that the space they are looking at, in a certified commercial kitchen, works out! Thanks again! Have you thought about starting a petition on Change.org , Move on , or Care 2 care, or upworthy? Easiest and faster way of spreading the word. Also, Can’t you just plug in the Approved refrigerated truck and use it for storage and then to transport? No refrigerated truck; meat stays frozen till its packed for market, then goes in small portable freezers that run off supplied electricity at the markets. The cost of running a refrigerated truck is ginormous, whether it runs off electricity or gas, so alas, would not be a practical solution. But – thank you so much for your suggestions! Having lots of ideas bouncing around is such an important part of our community, and they are much appreciated! If it comes to it, we will certainly do so on their behalf. However, since it looks like they have found a commercial kitchen in which to store their freezers, we’re just waiting for the County to sign off on everything. The calls made the enormous difference, by letting county officials know that there was huge public support – so critical. I received this alert via WAPF and sent the below letter to all parties. This has drivin up sales for the health food store as it’s not only sold beef there, but brought in customers who never shopped there before. Feel free to contact me and we can talk more about this. I’d like to help you if I can. We ALL want to help good farmers like you! God Bless – all will be well, just going to take some doing! 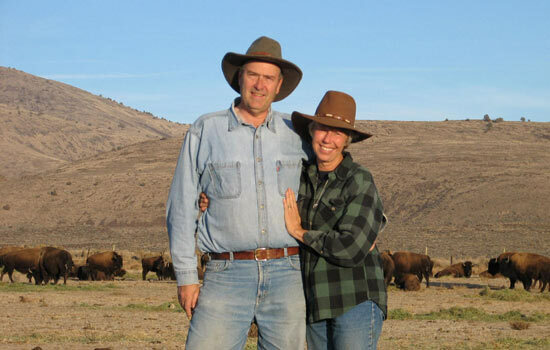 It is my understanding that Ken and Kathy Lindner, proprietors of Lindner Bison, are in need of commercial space to house their freezers that hold their high-quality, grass-fed, humanely raised bison meat so they can continue to sell at the weekend Los Angeles-based farmer’s market. It is farmers such as the Lindners that need your full support as our country continues to migrate towards more sustainable, humanely-raised, grass-fed animal products – food that our ancestors enjoyed consistently until the advent of industrial farming pushed its way into the cities. Ken and Kathy Lindner need your help. Please immediately lift the ban and stop all legal action against them, and see to it that these small family farmers are allowed exemptions from what is expected of big agribusiness as it pertains to the strict regulations with gaining access to freezer space for their meat. They have had a spotless reputation in bringing superior quality meat to families all over Los Angeles, as well as their tremendous efforts to restore the bison to the state. Currently, our small family farmer here in Minnesota has been able to bring in their grass-fed beef to the local health food store, and they store their beef in a simple chest freezer. This complies with health regulation, and should as well for LA County. Please rise to the occasion, and serve the good people of LA who depend on this healthy meat that the Lindner’s provide and have provided for over a decade. To miss even one farmer’s market because of over-zealous regulations, regulations meant and fitting for huge food distribution corporations, do not fit properly for small-family farmers and is ridiculous. It will cause the family farm to go under if this continues. Then you’ll have a lot of explaining to do to your constituents who have put their trust in you to serve them – so please take action now.